A delivery truck carrying a boom lift struck a bridge in Oklahoma City at last week, causing a section of it to collapse. The incident occurred on Thursday afternoon when a tractor trailer belonging to Sunbelt Rentals with a JLG articulated boom lift passed under the May Avenue Bridge which carries the Northwest Expressway. 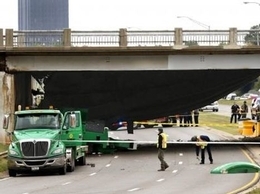 It seems that the boom caught the underside of the bridge and caused the structure to collapse. The driver said that he had easily passed under the bridge when travelling in the opposite direction, so naturally assumed that it would be good on the opposite side. No one was hurt in the incident. The bridge is marked for a clearance of 14 feet four inches, around 4.37 metres, so the rig should have cleared it easily enough.